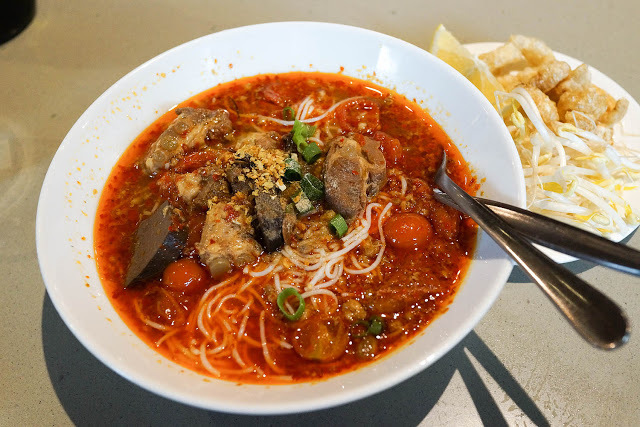 Cheng Kitchen has one of the largest ranges of Thai noodle soups in Sydney, so we take ourselves on a Thai soup boot camp to explore them. The menu at Cheng Kitchen is a wondrous range of Northern Thai favourites with sum dtum (som tum), salads, curries, stir fries, grills, fried noodles and 'one-plate wonders' to tempt you. You might be familiar with mostly southern or north eastern Thai, but this is on of the only places in Sydney you can get food from the northern towns of Chiang Mai and Chiang Rai, up along the Burmese/Thai/Lao border. We've decided to focus this post on one part of the menu, the noodle and soup section, not only because noodle soups are one of our most favourite things on earth, but to give ourselves a little boot camp in all the wide range of flavours to be found in Thai soups. There's more to Thai soup life than laksa. 54. Khao Soi with chicken. Probably the one soup that any traveller to Chiang Mai tries and loves, it's been hard to find in Sydney. This is more like a thick curry than a soup, deeply yellow in colour, creamy from coconut and not too spicy. The top of the bowl is covered with deep fried noodles, which slowly dissolve into the broth. Fixings for extra khao soi goodness. Add the pickled mustard greens, fresh red onion, lemon wedge and deep fried chilli as you want, these fresh and fermented flavours cut the richness of the coconut broth. 55. Khanom Jeen Nam Ngiaow. This was our favourite noodle dish in northern Thailand, a slow cooked mix of tomatoes and either pork, fish or beef. It's a massively flavourful bowl of soup, with added punches of flavour from the 'blood tofu', cubes of congealed blood that sound confronting but are actually just a bit meaty and have a tofu like texture that won't scare you. The colour also comes from the flower of the kapok plant, we've found this mystery ingredient in Pontip as well as preprepared spice pastes for nam ngiaow. 57. Boat Noodle soup. While down the road at Choi Siam you can get Sydney's cheapest boat noodle soup at $4, this bigger bowl is worth a try. The broth is thick and brown, it's traditionally derived from pork blood and gives the broth colour and deeper flavour. Under the noodles there are small pieces of pork innards and pieces of pork meat, while the balls bobbing along the top of chewy and bouncy. It's a filling bowl of goodness, more than just a snack. The condiment jar, the most essential requirement for Thai soups. It's up to you what you add, necessary to get the right balance of sweet and salty, fishy and chilli. When your soup arrives on the table you are expected to change the flavour according to your taste. After a while the chilli flakes become a little addictive, but we'll never get used to the Thai habit of adding a couple of spoonfuls or more of sugar to their soup. 59. Tom Yum Ma Now. There's something about this soup that is immediately familiar and satisfying, yet still packs a little surprise in each spoonful. Its full to the brim with a slightly chilli, slightly sweet and slightly sour broth and vermicelli noodles, then covered with pork mince that's irregular in shape which gives you little random meatballs. Fish balls and a few square shaped ones, crushed peanuts and slices of crisp wontons finish it off. You might want to add some fish sauce to cut the sweet broth, of course it all depends on your taste. 60. Bitter melon chicken noodles. This soup goes on and off the menu depending on the price of bitter melon. If it's on, don't be shy and try it. The bitter melon is cooked until it is soft and lost most of it's bitter bite. The chicken is also fall apart soft and the broth is dark with slight star anise base. 62. Guay Jub. The name of this dish sound like a long lost Star Wars character. This is one for fans of animal innards, it's jam packed with bits of liver, lung and intestines, as well as bits of meat and deep fried tofu cubes. The broth is a dark soy based one, with light rice noodles that roll up into curls when cooked. We also love the version of this at Thai Thai in Redfern / Alexandria.